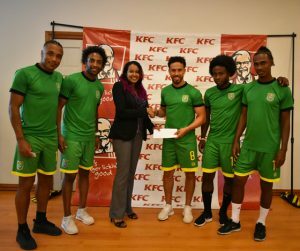 Corporate Guyana has come on board and partnered with the Guyana Football Federation (GFF) to ensure Guyana’s Senior Men’s National Team, the Golden Jaguars, are well prepared for the crucial match against Belize on Saturday. Ansa Mc Al has acquired the “Beer rights” for the match and will have bars at the match venue, Sureia Manufacturing Inc, has donated 100 cases of Aqua Pur Water to the team to aid their training and match day activities and KFC has purchased 200 tickets, which will afford patrons an opportunity to roar for the Golden Jaguars. 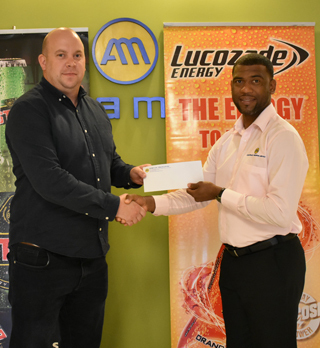 Errol Nelson, Business Unit Head of Ansa Mc Al’s Non-Alcoholic Beverage Division presents the cheque to GFF’s TD, Ian Greenwood. KFC’s Training Manager Charissa Rampersaud presents match tickets to Golden Jaguars’ Samuel Cox in the presence of other players. Tickets for the match are being sold at $1500 at the following locations: Andrews Supermarket – Aubrey Barker Road, South Ruimveldt, The Guinness Bar – Durban Street, GT; West Indian Sports Complex, Robb Street; Nice Restaurante, below Space Gym, Croal Street, GT; Pegasus Hotel Guyana; KFC Outlets – Regent Street & Mandela Avenue; Dad’s Fish Shop, Den Amstel; Patsy Food Court And Bar, Soesdyke Junction; The Fashion Box, Vendors Arcade, Bartica and at Giftland Mall. Fan jerseys are also available at the GFF Secretariat, the Guyana Pegasus and Giftland Mall at a cost of G $5,000. Match time is set for 18:30hrs.